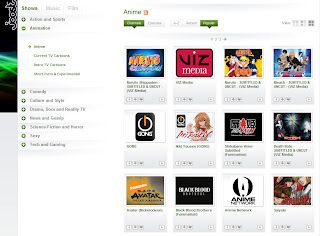 Shortly after posting about anime availability on Hulu, I received an email from a representative of Joost.com, informing me that they too have a number of anime titles. "I saw your post today about Hulu and its anime library. I work for an online video site that also provides legal anime, like Hulu," writes Kerry of Joost. I hadn't actually visited Joost in a long time, and so I headed over to their anime section to see for myself their offerings and how the site functions. Angelic Layer [watch] [info], dubbed. Aquarion [watch] [info], subtitled and dubbed. Bastof Syndrome [watch] [info], dubbed. Best Student Council [watch] [info], dubbed. Black Blood Brothers [watch] [info], dubbed. Bleach [watch] [info], subtitled and uncut. Blue Gender [watch] [info], dubbed. Buzzer Beater [watch] [info], subtitled. Cosmo-Warrior Zero [watch] [info], dubbed. Death Note [watch] [info], subtitled and uncut. Galaxy Railways [watch] [info], dubbed. Ghost Hunt [watch] [info], subtitled and dubbed. Gun Frontier [watch] [info], subtitled and dubbed. Ikki Tousen [watch] [info], subtitled and dubbed. Izumo [watch] [info], subtitled and dubbed. Jyu-Oh-Sei [watch] [info], subtitled and dubbed. Kiddy Grade [watch] [info], dubbed. Naruto [watch] [info], subtitled and uncut. Naruto Shippuden [watch] [info], subtitled and uncut. Peach Girl [watch] [info], dubbed. Rumbling Hearts [watch] [info], subtitled and dubbed. Saiyuki [watch] [info], subtitled and dubbed. School Rumble [watch] [info], dubbed. Shigurui: Death Frenzy [watch] [info], subtitled and dubbed. Shikabane Hime [watch] [info], subtitled. Shuffle [watch] [info], subtitled and dubbed. Slayers, The [watch] [info], dubbed. Slayers NEXT, The [watch] [info], dubbed. Super Milk Chan [watch] [info], dubbed. That's a pretty good lineup, and I guess streaming rights are available for mostly the same series, which is why we are seeing so many duplicates on both Joost and Hulu. The only series missing are Mushishi, Speed Racer, and Suzuka, which are available from Hulu. However, Joost seems to have a department that is working a bit harder on getting new material than Hulu. Kerry also informed me that they "add new anime every week (and are adding a number of new series in the next couple of weeks)." In addition to the above mentioned anime, Joost also has streams of news videos from Anime News Network [link], as well as Wizzard Media's Track-shun.tv video reviews [link]. At this stage, it does in fact appear as though Joost is paying closer attention to demand for streaming services. So here's a "Thanks!" to you guys. And if you are reading this, I have a couple of suggestions. First, it would be helpful to know on each series' thumbnail if it's a subtitled or dubbed anime. This could be easily accomplished by adding another mini-icon. Second, it may be prudent to take to heart Marc Andreesen's proposition to link a free service such as this with purchasing options. Adding the ability to buy the anime on DVD or via digital download would not only be beneficial to the industry as a whole, but I also imagine it would bring more partners on board for Joost. The end result should be additional revenue for all parties involved. So good luck to Joost, and good job. As for the rest of you, enjoy the free anime out there, and feel free to let me know if more series are added to the lineup.